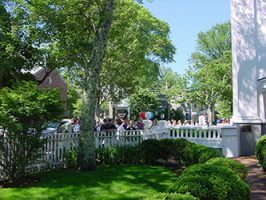 The Nantucket Atheneum recognizes that its public spaces are primarily for library use and for occasional use by community organizations. 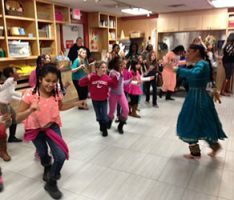 When not being used by the library and during regular library hours, the Gallery, Learning Lab and Great Hall may be scheduled for meeting use by non-profit groups and public organizations engaged in educational, cultural, intellectual or charitable activities. Meeting rooms are available to the public on an equitable basis, regardless of the beliefs or affiliations of individuals or groups requesting their use. 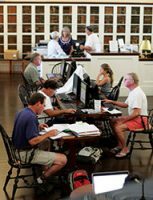 No public space or meeting rooms in the library may be used for a non-library sponsored event requiring an admission fee or for meetings, sessions or events involving financial gain, such as fundraising, private tutoring or consulting. 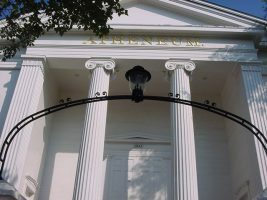 The Atheneum does not advocate or endorse the viewpoints of meetings or meeting room users. No rental fee will be charged for meetings that do not require electronic equipment. Meetings that require audio or video conferencing may use the space for a fee of $200 for up to 2 hours and $100 per hour after that. Meeting organizers are responsible for cleaning and leaving the premises as they are found. 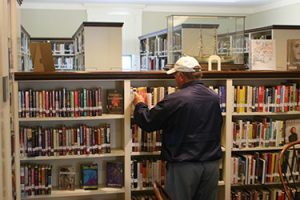 The library staff is not available to assist in room set-up and break-down. Only light refreshments may be served. There are two study spaces suitable for one or two people. Reservations are required and use of a study room is free of charge. The Great Hall and the Atheneum Garden may be rented for receptions. Contract and rental fees available by separate request. Reservations for the use of library space may be made by contacting the Adult Programs Department with advanced notice of one month.